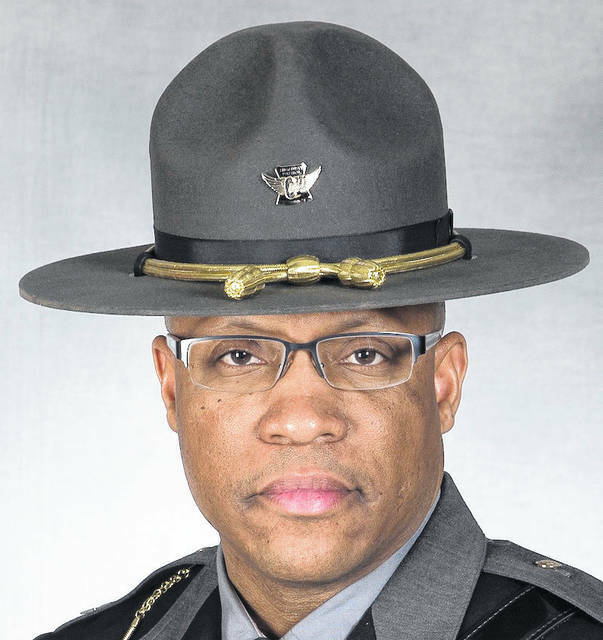 Captain Chuck A. Jones was promoted to the rank of major March 28, by Col. Richard S. Fambro, Ohio State Highway Patrol superintendent, during a ceremony held at the Patrol’s Training Academy. Major Jones will remain in his current assignment in the Office of Training, Recruitment and Diversity. He began his career in February, 1994 as a member of the 126th Academy Class. He earned his commission in July of that year and was assigned to the Marion Post. In 1998, he earned the state proficiency award in auto larceny enforcement. In 1999, he was promoted to the rank of sergeant and transferred to the Delaware Post to serve as an assistant post commander. As a sergeant, he also served at the Patrol’s Training Academy and as a Lieutenant. Jones also served in the Office of Personnel, Columbus District Criminal Patrol Unit and the Marion Post. In 2013, he was promoted to the rank of staff lieutenant and remained in the Patrol’s Training Academy. As a staff lieutenant, he also served at the Bucyrus District Headquarters. In 2018, he was promoted to the rank of captain and transferred to the Patrol’s Training Academy. Major Jones completed training at the FBI National Academy in 2005. Active in his community, Major Jones is completing 12 years, his third term on the Cardington-Lincoln Board of Education.